Tampa Headshots for professional actors and talent by Tampa Headshot Photographer Chris Passinault. Featured headshot of Tampa actor and model Jinelsa Rosado. The choice of professional actors and talent. Tampa Headshot Photography and Tampa Headshot Services by Aurora PhotoArts Tampa Photography and Design. For rates or booking, contact our Aurora PhotoArts client services department at (813) 546-0092, today. NEWS 04/09/15/0919 - This Tampa Headshots marketing and support site for Aurora PhotoArts, which currently uses an old Huey Class site, is about to be replaced by a new Mosaic Class marketing and support web site. It will be joined by several other Mosaic Class sites targeting the headshot market in the Tampa Bay area. Those whom aspire to compete with us in this area, the pretenders, are about to become seriously outgunned. Simply put, we are the best value in headshots and headshot photography for actors, talent, models, and professionals. We know what we are doing, know the difference between headshots and portraits, and give our clients effective, relevant headshots. We can prove it, too. We are also the choice of professionals, and have been since 2001. We have no problem with our work being seen alongside the work of the pretenders, and we bet that it’s not the same the other way around. Our headshots are better than the ones that other “photographers” do, and that is why professionals choose us. We know it, our clients know it, and our aspiring competitors know it, too. Our headshots sell better at higher rates, too, because they are worth it. Do you seriously think that your actor and talent clients can compete with ours with the “headshots” that you are giving them? We didn’t think so. Give up. Now. Before you embarrass yourself. NEWS 11/26/13 - Updated Tampa Headshots in preparation of new Mosaic Class web site in 2014. More web sites coming before that happens, however, and they will be Mosaic Class web sites (for those who are trying to market headshots in Tampa Bay online, you may refer to them as Death Stars). These new sites have been in development for some time now, and they are coming. Mosaic Class sites are state-of-the-art web sites that cannot be undermined or stopped, and even if they could, they are designed to be easily and quickly mass produced, so there will be too many to handle; if anyone is able to undermine one, we will know, and at least two more will take its place. Kind of like a swarm of hungry Horse Flies or angry Hornets, or, for those of you into relevant current pop culture, The Borg. In those analogies, you cannot fight. You can only run. We are talking complete and overwhelming superiority over the opposition. They may as well pack up, go home, and hang up their cameras, as competition will prove to be futile. We have sat back and watched the Tampa Bay market become overrun with “photographers”, many of whom are amateurs pretending to be professionals, think that they can do headshots, and that what they are marketing are headshots. We’re sorry, but mediocre, high-key consumer portraits are not headshots. We know that, and so do the professionals who keep booking us. The clients of these so-called photographers find this out, too, when they cannot compete with our clients. You have to sit down and wonder why it was that you were not able to audition, and why you rarely audition. This Tampa Headshots marketing site for Aurora PhotoArts was unfairly penalized last year for having too much content, and for dominating search results. This resulted in us losing placement in at least one search engine (although we still dominate in the others). This will be rectified. Aurora PhotoArts is now working on at least five more Mosaic Class marketing sites for the Tampa Bay headshot market, and one of those will become our main headshot marketing and support web site. These sites will be everywhere, and no one will be able to avoid them. People will see them, and they will book us as a result, regardless of who else that they check out. We will not be ignored. For those who aspire to compete with us, and who are afraid of the work that we do because they know that it is better and professionally relevant, your nightmare is coming, and it will never stop; either learn to do headshots, or quit while you are behind, because this market belongs to us, and actors and talent deserve what we can give them, which are the best value in professional headshot photography and headshots in Florida. We will do everything in our power to save actors and talent from you, and to keep them from paying for your mistakes. They deserve better. For those who think that they can compete with us, believe what you wish. Just let it be known that to believe that is to underestimate us and what you are up against, and you handicap yourselves by underestimating us. Some of you need to quit trying to do headshots now, before you are humiliated and lose money in this business. Since this web site will take a while to rehabilitate with a certain search engine, the new web sites have priority, and they have to be built and launched first. These new Mosaic Class web sites will directly address the headshot photography market in Tampa Bay; there are at least five in development, and they will join others in a much larger overall online fleet of powerful web sites for Aurora PhotoArts. There could even be more. These web sites will have dominant search engine performance for relevant key words, and will be highly resistant to being penalized, as well as being reverse-engineered (i.e. accidently “helping” aspiring competitors learn how to do and market headshots). The new Mosaic Class web site for this Tampa Headshots site is a while away, and will not be built and brought online until sometime in 2014, after the others have been deployed and are fully operational. This is why we are now updating this web site to keep it current until then. You can choose to take this as fact or to disregard it. It doesn't matter to us, because the result will be the same whether you choose to believe it or not. Regardless, we are coming with everything that we have, and it would be a mistake to underestimate us. See our new updates section for more. NEWS 05/03/12 - Scrubbed Site Code. With intersite linking considered now to be overkill in SEO efforts, we have disabled our interlink array on this site in preparation for the launch of a new Aurora PhotoArts Tampa Headshots site. This site will now stand-alone on its own merits of having relevant, organized content, and we now consider SEO to be a benefit of having useful content to our visitors and site readers, instead of the goal. The upcoming Tampa Headshot Mosaic Class site, too, will be advanced. Very advanced. This current Huey Class site was designed and coded back in 2008. Since then, a lot of advancements have been made. The new site will be state-of-the-art, and it will prove to be very hard for our competitors and aspiring competitors to compete against. Which reminds us: Please makes sure that your photographer or photography studio knows what a headshot is, and what is appropriate for the type of headshot that you need. There are too many portrait and wedding photographers now trying to market headshots, when, in fact, they are branding consumer portraits as headshots. This is wrong. Use one of those so-called headshots for auditions, and it will hurt you. You want low-key photographs as headshots, too, for most auditions. Studio, high-key portraits are not headshots. There is a difference, and we know what it is because we are genuinely qualified, and experienced, in headshot photography and in designing headshots. We are not in this business to cash in on the ignorance os aspiring actors and talent. We care, and we want you to succeed with the most effective, quality headshots done in the Tampa Bay market. Please take advantage of our past decade of being the top headshot company in the Tampa Bay market. Call us and we will answer any questions that you may have (and we are even planning on putting a lot of useful information about headshots and about headshot photography on our new web site, which should be up and running in the coming weeks!). NEWS 04/18/12 - New Web Site Coming. This Huey Class web site will be completely replaced by a new, state of the art Mosaic Class web site in the coming weeks. In development since 2011, the new 2012 Mosaic Class site is expected to be a current, state of the art late 3rd generation marketing and support site until at least 2014. NEWS 01/13/12 - We will retain and relaunch this site. It was decided earlier this week to retain the Tampa-Headshots site and to relaunch it as a new Mosaic Class web site, joining the new Tampa Talent Headshots Mosaic Class site and at least two more headshot marketing sites, one of them another Mosaic Class site, and the other a more advanced 4th Generation marketing and support site (This current Huey Class site is one of our most modern 3rd Generation sites, being almost four years old, the current main Aurora PhotoArts site has been using a 3rd Generation Venus Class site for almost seven years now, and the new Mosaic Class site is a state of the art, late 3rd Generation site designed to be upgradable to upcoming 4th Generation technology when it becomes operational and available. 4th Generation sites, which are now in development and will begin deployment in late 2012, utilizing databasing, flash, and multimedia technologies. All of the current Mosaic Class sites were designed with video support, however..... All Aurora PhotoArts marketing and support sites will include video testimonials, information videos, and video coverage starting in 2012!). We had stated in our last news post that we would no longer update this site, and would eventually phase it out, but we now plan on retaining, upgrading, updating, and using it. This Tampa-Headshots Mosaic Class site would not be integrated into the others that much, and would be more of a stand-alone marketing web site with a color scheme more like the current one. The other Mosaic Class site for headshot marketing would be more of a stand-alone marketing site, too. Tampa Talent Headshots would be the main headshot and headshot photography marketing and support site for Aurora PhotoArts, however, and would have a Mosaic Class site integrated into the meta site network, with a design synched for continuity and intersite navigation. This main Aurora PhotoArts Tampa Talent Headshots Mosaic Class marketing and support site would link to the other two headshot marketing sites, however. Not counting the two more stand-alone Mosaic Class sites, there will be 16 Mosaic Class Aurora PhotoArts built and deployed in the next 8+ weeks. Look at our headshots. Give us a call at (813) 546-0092, and spend a minute talking to us. You will then understand why we are the top headshot company in the Tampa Bay area, and why top professional actors and talent choose us for their headshots. We're confident that we will be your choice, too. Aurora PhotoArts Headshots. The choice of professional actors and talent. Our headshot photography services were top rated and heavily booked between January and April of every year between 2002 and 2014. Last year we did more actor heashot photography sessions than any other photography service. We expect demand to set records this year, and we are the best headshot photography company in the Tampa Bay area. This is for headshot photography and set up only. Headshot printing is a separate service, and discounts are available for clients who get their headshot photography done by us. All Aurora PhotoArts Headshots are printed on the highest quality stock for the best headshots available anywhere! This low cost, high quality service is for professional actors who need great photographs for their headshots. A good headshot photograph that the actor can actually use shows an accurate representation of what the actor looks like so that casting directors know what they are working with. Unlike modeling photographs, which demonstrate a range of looks (modeling is more like a visual form of acting, where each "look" is a "role"), an actor headshot shows the primary, accurate look that the actor has. Variations of that look can be done, however, and our headshot photography sessions allow for that, too, as we take two variations of the headshot look so that the actor has options for targeted promotion of their career. Additionally, the headshot set up is included in the photography package. Contact us for details on how this works. Actor Headshot photography services are guaranteed for quality at no risk to you. It is our main goal to give you quality pictures that you can use; pictures that work for you. CONTACT US for current rates and to set up your head shot if you already have pictures. For Tampa's best headshot photography, check out Tampa actor headshot photography and Tampa talent headshot photography services. Aurora PhotoArts is capable of creating stunning, effective, appropriate actor head shots; head shots that are considered by many to be the best in the industry because of the photography and the stock that they are printed on. We are a Tampa headshot photography company which consistently competes with and takes business away from headshot photography businesses in Los Angeles and New York. We dare you to compare ours with any other headshot photography service in Florida, Los Angeles, or New York. Our head shots are guaranteed, too, and set up is free if you use our photography services to obtain the images for your head shots. With reports of a number of Tampa wedding and portrait photographers trying to get into the talent headshot photography business, in the wake of us demonstrating that there is a market for headshot photography and design services, we have to ask if they know what they are doing. It obvious that some of these photographers are watching what we’re doing, as we are the market leaders, and are desperately attempting to compete. Wanting to work a market, and being able to do it effectively, however, are two different things. You have to know what you are doing, and that takes years of experience. You can’t just rush into headshot photography, and hope to be able to compete. Effective headshots are not portraits, and they certainly are not wedding photographs. Additionally, it is very, very difficult to shoot a great headshot in a portrait studio, as most headshots taken that way are shot in a rushed, assembly line fashion, and they come of as generic cookie-cutter portraits. It’s very different, and the photographer who does the headshots has to be qualified. Appropriate, relevant headshots can only be done by a headshot photographer who has, at least, several years of experience in shooting headshots. The photographer must know what casting directors are looking for, what is appropriate, and what is not, and how to take great headshots which are not just professionally relevant, but will stand out in a stack of headshots for the right reasons. As a casting director, I’ve literally gone through thousands of actor and talent headshots over the years. I learned over time, and by working with top actors and talent. I know what casting directors look for, and how to make the actor look their best in their headshots, as well as relevant for the role that they are auditioning for. I’m not some photographer who works some consumer market, who picked up a camera one day and said “Gee, that company is doing a good amount of business. I can do it, too! Headshots are just portraits, and I’ll just give my customers good pictures that they can use for headshots.” I know better, as headshots are NOT portraits, in my qualified opinion. Years ago, I set out to learn how to take effective headshot pictures correctly, and then refined my techniques over hundreds of photography bookings. I spent over seven years working on becoming one of the best in headshot photography, and I can tell you that many of these people trying to work the market now were not even photographers in as few as four years ago; it shows in their work, too. I’m an actor, too, and I can say that I would never go to those photographers for my headshots, as the headshots would be poor choices for promoting and marketing my acting career. Those who think that headshots are just great portraits might be able to convince people who don’t know what they are doing, such as the average consumer who aspires to be an actor, that they can give them good headshots, but professional actors and talent won’t fall for headshot photography which falls short of professional. I have high standards for headshots, and so do my clients. This is why my photography company, Aurora PhotoArts, continues to be the choice of professional actors and talent for their headshots, despite the increased competition in the market. It’s also why I, as a photographer, have been offered jobs at major headshot photography studios in prime markets such as Los Angeles and New York. I’ve been told that if I ever decided to leave the Tampa Bay market and move to those markets (and close my business), that they’d pay me well for the work that I do (which is a lot, lot more than what my rates are here). Since these professionals are in the business of headshot photography and design, and that’s all that they do, there is no greater compliment than that. And they do know what they do, as all of the “A”-list celebrities go to them for the headshots that their competitive careers demand. That’s what it is all about, too. The bottom line is that your career is only as good as what you put into it. Actors and talent must realize that they are competing against other actors and talent for auditions. That means that their headshots have to be able to compete with what the others are using. I am confident that my clients can easily out-compete the amateur actors out there who use studio portrait photographs and high-key portraits as headshots. I’m sure that casting directors look at what the amateurs are using, and see them as they are; they wonder if they are qualified professionals, and if they know what they are really doing. There are too many followers among the photographers in the Tampa photography market, and especially in the specialized Tampa headshot market. I’m a leader, and I am reminded of this every time I observe some photographer attempt to follow my lead, react to what I do, try to copy what I do, and attempt to compete with me. If you are a professional who is looking for the headshots that your career, and your professional image, demands, ask yourself this. Isn’t it worth going to the source for what you need, instead of settling for some second, or last, rate knock-off? Which reminds me of a story. An actress who had me shoot her headshots back in 2004 was very happy with her headshots, and referred her sister, who was an aspiring actress, to me for her headshots, recently. Her sister, however, was unprepared, and didn’t know much about it. When she called me and I told her my rates, which are a good value, she decided that she’d shop around and get her headshots as cheaply as possible, which, as we all know, is a false economy (and, it also made me wonder just how well she and her sister communicated about the subject. The younger sister had no clue about what appropriate rates for headshots were, as she was thinking more like a bargain hunting consumer than an informed professional). A year later, the original client contacted me and begged me to shoot her sister’s headshots. Her sister, you see, was going to move to New York and become an actress. I asked the client about what happened before, when her sister called me, learned my rates, and than promised to call me back. Of course, she never did call me back. The client told me that her sister did not know what she was doing, which I had guessed, and went to some wedding / portrait photographer to have her headshots done. Of course, the headshots were simple portraits, and proved to be useless for her budding career. Her sister found out, the hard way, that she had made a mistake. And, of course, some people never learned. The sister never contacted me, and although she did move to New York, she landed hard. I’m not sure if she is an actress today. Would my headshots have made a difference? I can’t say, but they sure would have given her an advantage over what she had been using, and who knows... maybe my headshots would have given her the edge that she need to land some good auditions, and be cast in roles that would have defined her career. I am sure that her chances for a career as a professional actress would pretty much be highly unlikely without good headshots, and if you have headshots which are not good, you might as well not even try. You will not get to audition at anything worth the effort, and, like any career or business, if you are not seen, you’re not in business. Which reminds me of what I’m seeing in the market. As an example, I will show here, right now, a little bit of what I know about effective headshots. On a simple note, let’s compare the difference between high key, and low key, headshots. I shoot primarily low key headshots, which are the most appropriate for actor and talent headshots. What is low key? A low key headshot is a headshot which is shot with a dark background, a simple background which will not take attention away from the subject, which, in the case of headshots, is the actor or talent pictured in the headshot. In any type of photography, you have to figure out what the subject of the photograph is, and compose the photograph around the subject; nothing in the frame should distract from the subject, and the background of the photograph should always be as clutter-free as possible, with composition which leads the eye to the subject, rather than away. For compositions which cannot avoid a busy background, there are techniques which can make the photograph work, which include under exposing the background in relation to the subject, or minimizing the depth of field so that the background is soft and out of focus. Wedding photographers, in general, are the most guilty of using an overall lack of composition in their work, with pictures that show their clients at locations, locations which take up too much of the photograph; while that might work for the consumer, who generally can be convinced that a mediocre, or poor, picture is good because they are in it, somewhere, it proves to be a disaster when the photographer attempts to move to more specialized photography markets with educated clientele. Some of these photographers are finding this out the hard way, at the expense of the customers who are convinced to buy into whatever it is that they claim to be selling. So, what is high key? High key photographs are portraits, usually, shot in a studio set against a bright background. The bright background detracts from the subject, which is the person in the headshot, and tends to turn off casting directors. Sure, they might look clean and slick, but they are far more appropriate for consumer portraits than for talent headshots. As a professional photographer, I can give my clients high key headshots if they wish, but I don’t recommend it. The best actor and talent headshots are low key photographs of the subject, with clean, dark backgrounds, which tends to draw the eye to the actor. There are other secrets, too, but I won’t go into that here, as I know that my competition, and aspiring competitors, read my web sites; I'm not in business to train photographers. This is why I can turn out better, and more effective, headshots on location than studio photographers who shot headshots in the studio. Another thing that I see in the market are big red flags, and anyone in the market for headshots should be aware of those red flags. First, I’m seeing wedding and portrait photographers who try to become headshot photographers. Sure, they do ok work as a photographer, but it’s obvious that they should stick to shooting family portraits and weddings, and not headshots. One photographer that I saw did a shoot at the University Of Tampa, and the compositions of his photographs detracted from the subject, which is a big no-no in modeling portfolio and talent headshot photography. I’m guessing that this photographer knows that he isn’t that great composing his photographs, because when it comes to headshots, he retreats to the studio, and tries to pass off “safe” high key portraits as headshots. He also describes himself as trying to emulate some “famous” photographer who is supposed to be one of the best headshot photographers in the country, or whatever. He also claims that he owns a really expensive camera, which is supposed to make him a professional photographer. Whatever. I say that this photographer needs to work on his own style, and skills, instead of trying to copy others. I learned photography by working with professional models and talent, through years of hard work, and applying what I learned in photography. I did not learn the mistakes of others; I made my mistakes along the way (none at the expense of anyone, by the way), learned from them, and became a better photographer that way. I did not study, or copy, anyone. I still don’t. Perhaps this is why most Tampa photographers pay attention to what I do, and try to copy what I do. Doesn’t anyone out there have an original thought in their head? Can they think for themselves? Are they original, and creative, enough to be able to pull off the work that professionals need? From what I see, I would think no. As for me, I could care less about what the pretenders try to pull. I’m the leader, and I’m the source. Allow me to prove it. Another area in which they try to compete with me in is helping actors and talent. These photographers don’t know anything about the business, and are not qualified to give advice to anyone, so they hijack modeling and talent resource sites and refer their customers there. They say that the actors who book them for headshots ask them questions about the industry, and they give them all of this great, and useful, information. Do they actually know what they are talking about, however, especially when they demonstrate that they do not even know what a good headshot is, and the web sites that they refer actors to are nowhere near as good as mine are? That’s right. I’m much more than just a photographer. I’m also a top modeling and talent expert, and I am the author and webmaster of the top modeling and talent resource web sites in the world. In that respect, considering the complete package, there isn’t a photographer, anywhere, who can offer what I can to my clients. Do they own Tampa Bay Modeling, Tampa Bay Acting, Tampa Bay Talent, Tampa Bay Film, Independent Modeling, Independent Acting, and other top web sites? Can they write about the industry like I can? Do they have the experience, and the knowledge, that I do? Do they have my contacts? Are they friends with the best actors, models, and other professionals, many of whom met me as clients, in the market? I didn’t think so. They need to consider what they are up against. They can’t compete with me, and they know it. Aurora PhotoArts Tampa Headshots. We earn the trust of professional actors and talent with the best value in the top quality, effective headshots. Allow us to prove it. To us, “headshots” are more than just a word used to market a service. We know every aspect of the meaning behind the term “headshot”. Headshots are what we do, and one of the types of photography that we specialize in. We’re not some wedding photographer, portrait photographer, or some aspiring modeling photographer who decided one day that we would sell headshots to talent. We actually know what we are doing, and also realize that our clients, who are professional actors and talent, are more educated about what they need for their career than the average consumer looking for pictures of whatever they want. We give our clients what they need, as well as what they want. Selling wedding photography and portraits to the consumer is easy, and frankly, to do that kind of work doesn’t take much skill, or experience. We’re not looking to cash in at the expense of our clients like so many others do. The headshot services that we provide in the Tampa Bay area are services that we have been offering for many years, and after a brief conversation with us, professionals know that we can give them what they are looking for. We are qualified, and we really know our headshots. Even after looking over what other Tampa Bay area photographer have to offer, professional actors and talent choose us, and are not disappointed. Our headshot photography and design work is guaranteed for quality. We actually care about our headshot work, too. We know headshots, and we have earned our reputation for quality and expert knowledge in what makes an effective headshot. Do the others? We don’t think so! We set the standard in Tampa Headshots and headshot photography in 2002, and we continue to maintain that standard of the best quality and value. We are the best headshot photography and design company in the Tampa Bay area, we know headshots, and we know how to create effective career marketing tools for professional actors and talent. The only headshot solution that you will ever need in the Tampa Bay area, and our qualifications, as well as the consistent high quality of our headshots, is the reason that professional actors and talent choose us over all the others. You only need one headshot photographer for the best headshots, too, and that headshot photographer who you are looking for is Aurora PhotoArts lead photographer C. A. Passinault. C. A. Passinault is not only a legendary headshot photographer in Florida, but he is also one of the top headshot, acting, talent, and modeling experts in the United States today. He not only does outstanding photography work in modeling portfolio photography, as well as talent headshots, but he knows the difference between the different markets. Why settle for a bunch of mediocre photographers who don’t know the difference between a headshot and a portrait? Why settle for photographers who market headshots, but obviously don’t show it in the work that they do, and who do not inspire confidence in the actors and the talent who they market their services to, because they do not know what they are doing? You need to go to the authority of headshots in the Tampa Bay area. Tampa headshot photographer C. A. Passinault, AKA Chris Passinault, also holds an ace card. Why is he a talent and modeling expert? Because he is one of you, too, and unlike most photographers, has actually been where actors and talent are! Chris Passinault is a professional actor who, in the 1990's, acted in a lot of local Tampa television, and was offered the lead roles in Tampa stage productions. Passinault is also a certified casting director, with years of experience marketing, putting together, and executing auditions which effectively cast roles in indie films, stage productions, and other projects. Passinault spent years looking at thousands of headshots, and this helped him to learn what worked, and what didn’t. All of that experience goes into each and every one of our tampa headshot photography and design services. No other photographer in Florida has the qualifications that C. A. Passinault does as a headshot photographer. Not only is he one of the best headshot photographers in the country, but his professional experience in the entertainment industry gives him an advantage that no other photographer can touch. You owe it to yourself to give your career the advantage that Passinault can provide. You can’t fake it in headshot photography, and in creating effective talent headshots. Professional actors and talent can spot a fake instantly, and they easily realize that some photographers are simply trying to cash in at their expense. Photographers who want to do headshot photography and headshots owe it to their customers to learn what they are doing. Headshot photography alone is a highly specialized photography market, and it takes, literally, years to learn how to properly shoot effective headshots that will benefit the careers of the professionals who have to have them. We can spot fakes, too, because, much like our actor and talent clients, we also know what we are doing. We often look around on the Internet at other photographers who are offering headshots services in the Tampa Bay area. Of all of the hundreds of photographers, only three have our respect in the headshot photography market, and of those three, we still offer the best value to anyone looking for the headshots that their career needs. Of the others, a few are aggressively offering headshot services, and we’re frankly not impressed with what they are trying to sell. In our opinion, some of these so-called “professional” services are so off-the-mark, and inappropriate for headshots, that it could be considered to be misleading. What do we think? We’ll tell you, and keep in mind that this is just our educated opinion on the matter. Well, hypothetical scenario or reality, we’ll let you decide, but there is a good question to ask. Would you rather go to Passinault, the source of the best Tampa headshots, or do you want to go to some photographer who thinks that headshots are portraits, and who spent time learning what little they do know from Passinault? The real deal, or some low-rent, counterfeit knock-off? Actors and talent know this, too. They realize that the true power in their headshot investment is in value. That’s why many of them speak of “Passinault” headshots with hushed reverence, and say “Nice. You have a Passinault headshot!” like it’s a high quality brand name. Other photographers know this, too, even the pretenders. That’s probably why they seem to be afraid to go head to head with our headshot photography services; they know that they cannot compete. It doesn’t stop other photographers from trying to compete, however. One recent tactic that we’ve seen has been especially amusing. A photographer realized that our site was seen in the first page of search engine results along with theirs, and that their photography could not even begin to compete, despite their low rates. They figured out that they were losing their business to us (as it should be, but it should be added that one thing that they probably did not realize is that we also get a ton of client referrals from many of our previous clients, actors and talent who know other actors and talent, and who were so please with the headshots that they obtained from us that they told others about it; a factor which probably explains why many of them consider our headshots to be a coveted brand-name. They probably did not realize this, too, because they probably don’t get referrals from their previous clients; we’d be very surprised if they did, judging from the work that they have up on their web site). So, the photographer probably decided that if they were not able to compete, that they would make it difficult for us to get business by acting as a “photographer agency”, with a supposed network of “photographers” who could give them what they need. “Hey”, they probably figured, “if we can’t get work, neither will our competition. They can’t compete with all of us, and since I can’t compete with any of them, this is my only chance to make some money”! Of course, such a gang-up strategy can be a double-edged sword, too. How? Much like headshot photographers have to know what they are doing, so do people who try to run a business referal network; if they don’t know what they are doing, it will backfire (and there are reports that it already has). Well, for starters, if they don’t know what a headshot is, and how to evaluate headshots, then how would they be able to recognize an appropriate headshot photographer, and then refer their customers to them? Also, when a photographer sets up a headshot photography site, and then they have to refer headshot work to other photographers, how does that help their credibility? So, you set up a headshot photography business, and after a couple of years start to refer people to a “network” of the best headshot photographers? Do they really know the best headshot photographers, or are they just saying that? Well, they don’t know us, so we’d have to say that the credibility of the statement claiming to know all of the best headshot photographers is in serious question. At any rate, what is it that the main photographer does, anyway? Can he do the photography that he claims to be able to do, or does he have to go the “those who don’t do, teach” route in regards to having to refer client leads to other photographers? With most of the photographs on his web site NOT being headshots (hey, I’ll just throw up this backlit modeling portfolio picture up on my headshot site and call it a headshot! Actors and talent are probably just as stupid as the usual people that I deal with, and they won’t know the difference! ), but the photography is mediocre at best. Is their plan to insult the intelligence of their target market, which, being actors and talent, are much more educated than the relatively ignorant consumer market that they’ve been working in? Do they expect that to work? Are they really trying to simply cash in on the Tampa headshot market which we dominate, and try to make money at the expense of the professionals that they are trying to convince that they are the best? There is a saying in business, and that saying is that any business plan that depends upon the ignorance of the customer is a bad business plan. In our opinion, we don’t pose as much of a threat to their business as they do to themselves. Some people are not cut out for business, as well as photography. We see the “network” move, and it simply looks like they are panicking. Do you have to resort to being a faux agency for other photographers because you can’t do headshot photography well? Why DO you market headshot photography services when the work that you show has nothing to do with headshots? Also, why is the work that you DO show as flawed as it is? We certainly would try to market anything with the pictures that you try to use. Could it be that they don’t want you to see our headshot work? What are they afraid of? We’re Aurora PhotoArts, and we can prove that we are the best choice, and value, in Tampa headshots not just in our words, but in our actions, and in our work. This said, go right ahead and look around at other photographers. We’ll be happy to talk to you about the headshots that you need, and that we can give you, after you come back to us. In our opinion, comparing our work to the work of others makes us look really good in comparison, and it certainly qualifies our claims of offering the best value in headshots. We looked, too, and if we can’t find a Tampa photographer or a photography company that can do what we can do, it’s unlikely that you will be able to do so, too. Just don’t take our word for it, though. Go ahead and see for yourself. You can call us after you’re done wasting time. In regards to the headshot pretenders out there, too, our recommendation is to take a break and take the time to learn what they are doing, or to give up and quit, because we’re coming for your clients! We certainly hope that some of these photographers didn’t look at what we were doing and then set out to compete with us, because it will prove to be a mistake. We just love competition, although we rather get annoyed when certain people use our property to try to compete with us, and those aspiring competition will find that competing with an established, tough competitor, which would be us, will be the toughest fight of their career. Here’s to the photographers and the photography companies out there who foolishly set out to compete with us, and then fail (and we’re sure that, eventually, we’ll finally get some strong, ethical, professional competition, it’s that we just haven’t see it yet, so our statement stands). Many have tried, many are now out of business, and we expect this historical cycle of rising and falling to continue. We will fight for the integrity of the Tampa headshot photography market, because professional deserve genuine headshots which will benefit their careers. We care, and we can’t say that about the others. That’s why we took the time to write this, so that professionals can be informed, and make the best decision. Oh, and one more thing. When you book Aurora PhotoArts, you get our Tampa headshot photographer, C. A. Passinault. Passinault did every single headshot on this web site. He doesn’t have to refer clients to other photographers because he’s the best headshot photographer in this market, in our opinion. While Passinault does network with other photographers, and can refer clients to other photographers if there is a need to, we certainly don’t use the “we can refer you to other photographers” as a selling point, because that’s not what we are in business to do. We do headshots, and we are the best qualified to do those headshot services. Anything else, such as referring away clients in desperation, just isn’t worth it. Some of this is simply common sense, but hey, we’ve some photographers out there trying to pass themselves off as headshot photographers when it’s obvious, to most professionals, that they are not. If they don’t know what headshots really are, they are not sure about what they are trying to sell, and they have to lie and/ or embellish to get business, can you trust them? Will they be able to give you what you need? Could it be that they are just after your money, without any investment into, or regards to, the services that they are marketing? 1. Make Sure That They Show Actual Headshots On Their Web Site, Or In Their Portfolio, If They Advertise Headshots. Modeling portfolio pictures, long shots, body shots, editorial pictures, portraits, and other types of inappropriate pictures just don’t cut it, and we’ve heard that one Tampa headshot photographer recently lost a customer over this issue (and we booked that client, who was happy with our headshots, and we laughed about it). Portraits are also not effective headshots, so don’t go to your local portrait photography studio or wedding photographer and think that, even if they are good at photography, that they will be able to give you effective, and appropriate acotr and talent headshots. The headshot pictures on our web site here are great, effective headshots. See the difference between what we have, and what they have? If the pictures that they are marketing on their web site are different from the ones that they show, it’s a good indication that they do not know what they are doing, and that they will be a poor investment for you. Some photographers think that, just because they take good pictures, that they can take good headshots. There is a lot to know about headshots and headshot photography, trust us, and it takes a lot of training, study, and hard work to be able to do it right. On average, it takes a talented photographer at least two years to be able to competently do headshots that are effective for professionals. That’s why it is a specialized field of photography, and why most photographers are not able to do it. If it were easy, and it did not require experience, everyone would be a headshot photographer, right? For some reason, though, they are not. 2. Talk To Them And Make Sure That They Know What They Are Doing. It’s easy to copy things off of other web sites and put them on your headshot marketing web site. We just love it when we see our copyrighted ideas on competitors web site (we own Tampa Bay Acting, Independent Acting, Tampa Bay Modeling, Independent Modeling, and many other talent resource sites. We’ve been seeing our material on the web sites of some of the photographer pretenders, and in some cases it’s outright plagiarism. If they steal from us, can you toy trust them? If they have to learn from us, doesn’t it make sense that we can do more for you than they can?). It’s easy to learn from others, and to steal ideas from others, but do you really know it? That’s why it’s important to talk to them. Ask them LOTS of questions. When our clients talk to us, it’s obvious that we not only know what we are doing, and that we know more than the photographers who try to compete with us, but that we also are behind all of the useful information on our talent resource sites. Featured headshot on this front page is of Tampa actor and model Jinelsa Rosado. © Copyright 2001-2015 Tampa Headshots. All rights reserved. Tampa Headshots web site commissioned and launched 111708.0300hrs. 04/09/15/0919 - Updated site code and information in preparation for the launch of our new Mosaic Class site. 05/03/12 - Removed most outbound links to affilaited sites and sister Aurora PhotoArts sites. Please see our Tampa Designer Blog for more. 04/18/12 - Preparing to replace the Tampa Headshots site with a brand new, state of the art Mosaic Class site. Aurora PhotoArts will retain and maintain this web site, and its domain name. Our plans have changed since this time last year. This Huey Class site will be replaced and retired in the coming weeks. 04/20/11 - Removed links to Eos MediaArts, as the site has moved. This web site is now obsolete. This current Tampa Headshots site will remain the same, as a new Tampa Headshots site will launch along with 15 additional Mosaic Class Aurora PhotoArts photography marketing and support web sites. This site will be decommissioned in 2012, and the domain name will be optioned for another photographer in 2013, if they wish. 08/07/10 - Added a lot of content in preparation for the Venus 3 upgrade. Added disclaimer. Preparing to retire this Huey Class marketing site. 08/06/10 - Adjusted site code. Preparing site for upgrade to advanced Venus 3 Venus Class marketing web site upgrade this month which will match the main Aurora PhotoArts Venus 3 Venus Class web site in design, as well as interlink with it. Will begin adding a lot of new content tomorrow. Editing latest client headshot photographs for addition on new site. The new Tampa Headshots marketing site will also be optimized to interlink, and work, with Tampa Bay Acting, Tampa Bay Talent, and Independent Acting talent resource sites. New Tampa Headshots site will be online in the next few weeks, and will be fully operational in September, 2010, and will join an armada of five other Aurora PhotoArts marketing sites, as well as the two huge Aurora PhotoArts support blog sites. 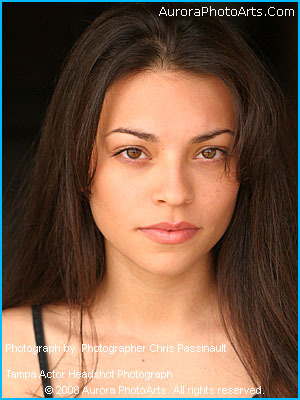 Tampa Headshots site index and directories refreshed 05/03/12. Tampa Headshots site index and directories refreshed 04/18/12. Tampa Headshots site index and directories refreshed 11/17/08. © Copyright 2008 Aurora PhotoArts. All rights reserved. Site designed and coded by Jedi photographer C. A. Passinault. A'ight. © Copyright 2008-2015 Aurora PhotoArts Tampa Photography and Design. All rights reserved.